If you had not already guessed from my Gluten-Free Disneyland-Days 2-5 post, I love breakfast. Specifically pancakes, french toast, waffles, and crepes. You know, the gluten-y, yummy stuff that is pretty much poison to my body. Not quite skull and crossbones I am going to die poison, but bad enough that I feel like I am going to die and am miserable (and miserable to be around). And even though I know how to pop some frozen waffles in the toaster, or dunk a GF bread in eggs, milk, and cinnamon, or even use Bisquick or Pamela’s to make pancakes, there is something nice about going out to a nice brunch. While I know omelets are always an option, I am looking for the taste, textures, and aromas that make my mouth do a happy dance and make me wanting to lick my plate because I cannot get enough. That is not too much to ask, right? Cover of the menu, with the shadow of my hand/phone. 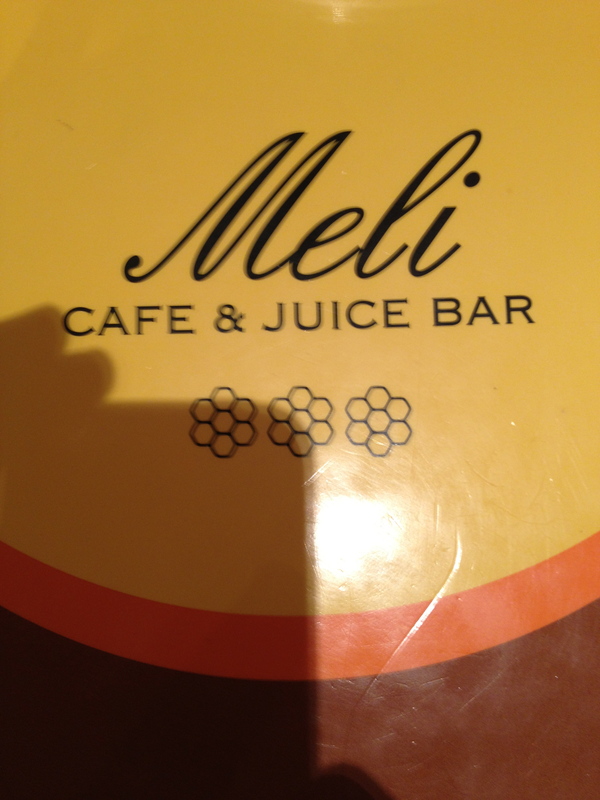 One of the things that attracted us both to Meli was their selection of smoothies. Cece ordered the Vegan (almonds, pecans, soy milk, maple syrup), while I tried the Peanut Butter (peanut butter, banana, frozen non-fat yogurt, milk, chocolate, and whipped cream). They were pretty tasty and something I would go back for again. Upon opening the menus we were shocked and surprised in the very best way. The second page of the menu was their GF offerings! Page 2! Of the regular menu! Since this is not something you see very often, our smiles got wider by a few degrees. 2 orders of french toast, 2 sides of bacon, and 2 smoothies. 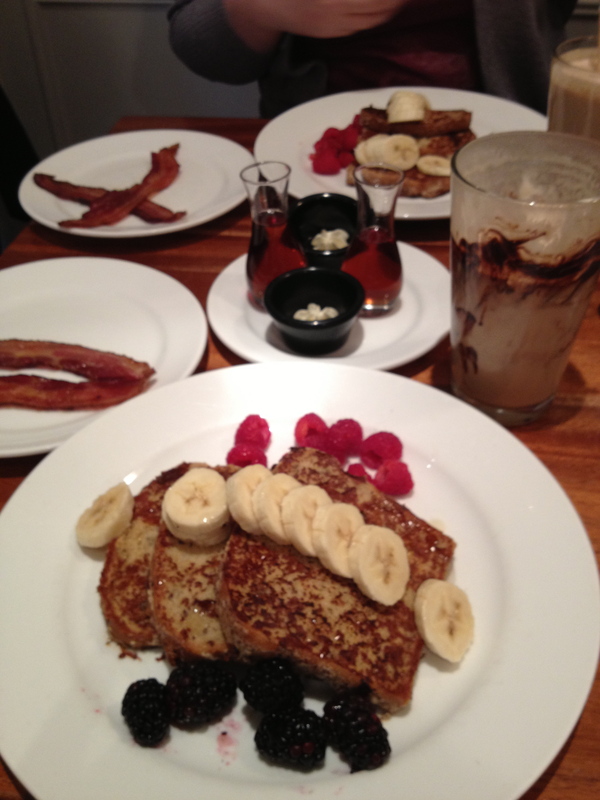 After looking it over, and weighing the pros and cons of trying the Polenta Pancakes, we both decided to try the Vegan Gluten Free French Toast. To me, the polenta pancakes did not sound as appetizing as GF bread dredged through a soy milk custard, topped with raspberries, blackberries, banana, and paired with an agave syrup. It sounds AMAZING!!!! Plus, add a side of bacon to the mix and it is almost a brunch lovers dream. Sadly, the dream ended with the visual presentation of the meal. After putting that little bit of butter and then drizzling that warm agave nectar syrup over my slices, I eagerly dug in. What I found was dry, dry, dry, weird texture, not delicious at all. Did I mention dry as the Sahara Desert? I slogged my way through a slice, ate all the berries, drizzled a bit more nectar on it and still could not bring myself to finish it. This is where the service started to get weird. Our server comes back, asks how everything is, I mention being less than pleased with it, and she whisks it away. Oooookay. About 5 minutes later she comes back and asks Cece if she is done (clearly she is not), and I mention that I would like to look at the menu to see if there is anything else I would like. While all of the following is going on Cece is letting her french toast sit, and sit, and sit in a puddle of agave syrup. For 20 minutes! At this point she declares that her french toast have enough moisture to not be a torture to consume. Menu comes, I look it over and decide that a crepe look really good (in small print under the crepes I saw they had a GF crepe batter). We ask about the preparation of the crepes and discover that, while they do not have a separate crepe maker, they clean it really well between batches. 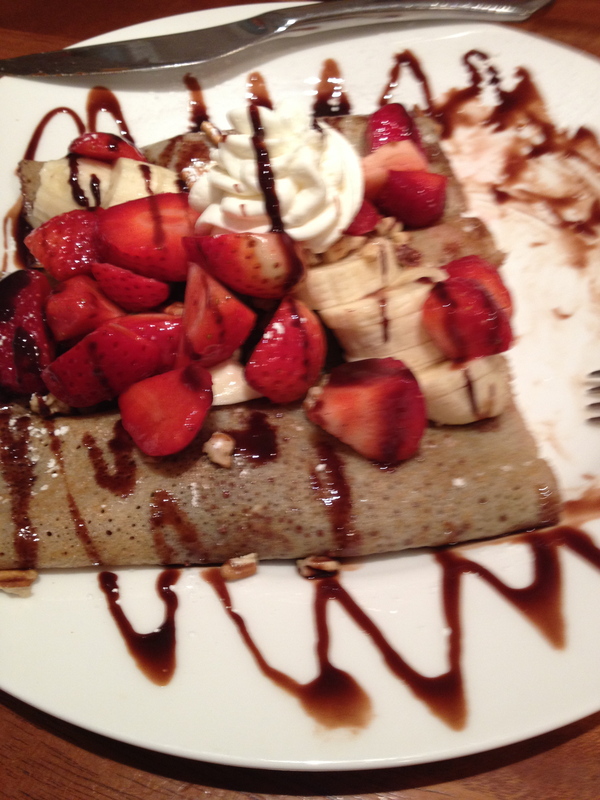 Seeing as how I was still hungry (and hearing Sapps voice in my head calling me an idiot for risking it), I decided that the Symphony Crepe (chocolate infused crepe filled with Nutella, strawberry, and banana, topped with banana, strawberry, and pecans) sounded pretty freaking amazing. As I ordered, the waitress let me know that I would still have to pay for my french toast, and I assured her that I was willing to do that. Maybe because I have a service industry background, but I found it weird that she felt the need to tell me that fact. However, I know there are people out there who want something for nothing, so whatever. Symphony Crepes after Cece and I gave them a try. My crepes arrive and they look DELICIOUS!!! By this point in the meal, I am very apprehensive. Not 5 minutes after the crepes are set in front of me, and BEFORE I EVEN HAVE A CHANCE TO TRY IT, the waitress is back asking if I am done and if she can box everything up. Wha-WHAT!?!?! Do you not see this fresh, untouched plate of food sitting in front of me? Do you not see Cece’s 1/2 drunk smoothie and the french toast still on her plate?? Instead of getting irate, we calmly told her I had just been served and we were going to be a while. The crepes, by the way, were tasty, but by this point in time the service and overall experience had been so bad that I was losing my appetite. The final nail on the coffin of my desire never to return came not long after when they brought us our bill. Along with a plastic cup and straw for the remains of Cece’s smoothie. Tactless, classless, and rude. At that point, we knew we decided to talk to the manager. I don’t really know if it was because they were super busy, I do not really care. But the fact they advertise gluten-free, yet cook it on the exact same surfaces as everything glutenous, is the first reason that I will not return to Meli Cafe. The second is the service issue. Brunch is a time to relax, catch up, gossip a bit, and enjoy the company you are with. It is not something for the servers to rush you through. Another friend of mine told me that their omelets are good, which I may (but probably may not) keep in mind in case I ever want to go back. But for me, the cross contamination possibility paired with not enough indoor waiting space and poor service is enough to keep me from making a return trip. PS: Cece is preparing to go on a cross-country trip along the Lincoln Highway doing an American Songline (basically singing the songs of the road from the time when it was a popular path across the US). Check it out and think about contributing to her Kickstarter campaign. That sounds like an awful restaurant experience. And it’s a shame because it’s so hard to find places that do gluten free breakfast or brunch. 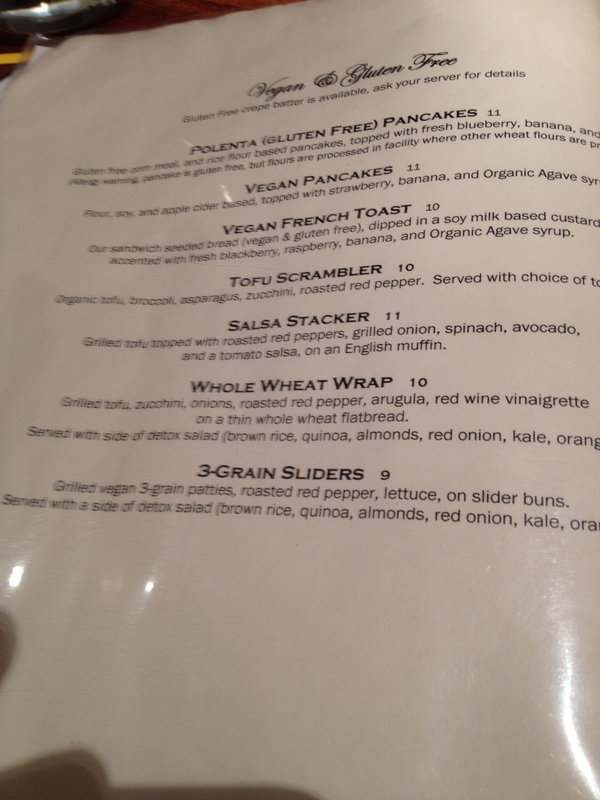 I actually just had a really great gluten free breakfast out – i was pleasantly surprised at the steps they took to avoid cross contamination. It was kind of awful, but I am thankful that Chicago has a lot of options. My experience at Disneyland showed me that you can have amazing dining experiences, with fantastic tasting food! Out of curiosity, where was your great experience?